When I found out that the company I work for was moving from Marin to San Francisco's Presidio, I was really happy that at last I would be able to try out Anne Gingrass's Cafe, Desiree, that I had read so many good things about. In the last few months I have visited Desiree several times and eaten some excellent sandwiches, salads and desserts there. They even had a jar of Cote D'or bouchee 'elephants' which recreated a happy childhood memory for me. I will never forget my first visit to Desiree, studying Anne, as she created a delicious chicken salad crepe at the open kitchen counter. She was concentrating hard on the task in hand, to the point of almost looking miserable. Then, as I watched, someone she knew entered the sunny space of her cafe. As Anne looked up to greet the customer, her face burst into the brightest, sunniest smile you could ever hope to be welcomed with. 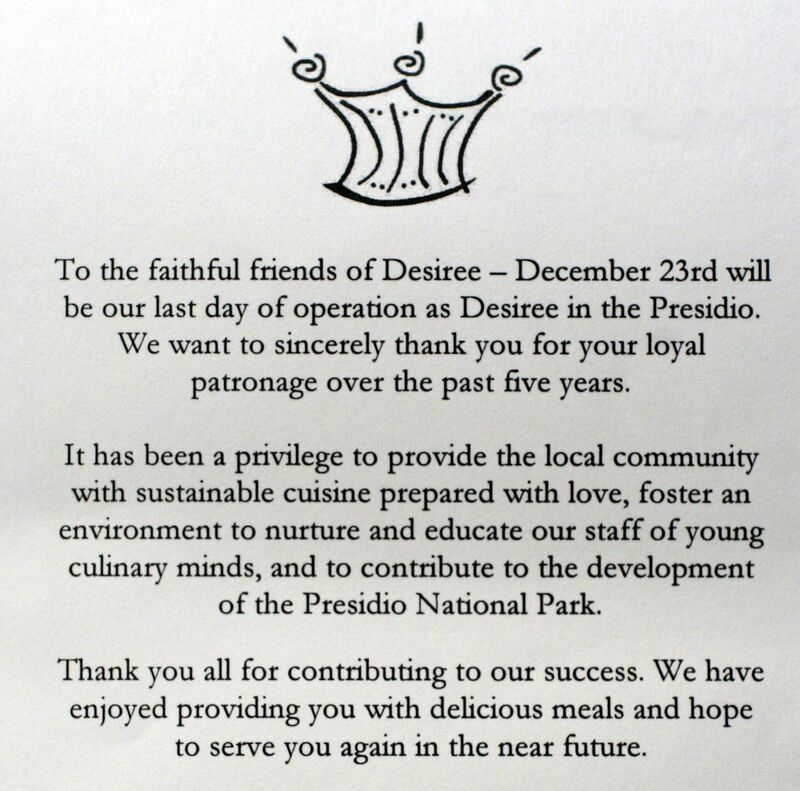 I am glad I had the chance to experience Desiree. It sounds like Anne might have future plans up her sleeve. Keep an eye on the Desiree website to be posted on developments. In the meantime we have news that Ray Tang's new joint is slated to open in the Spring, in the Presidio, so at least those working and living in the area have some new lunch options to look forward to. PS. Please continue to support our Menu For Hope Campaign. Have you donated yet? Archive Alert! 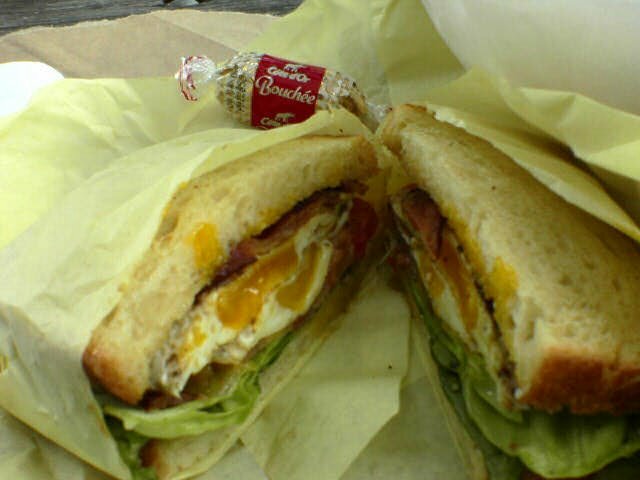 On this date in 2004: Brunch at Cafe Bastille. I always feel sad beyond all reason when I place I have loved closes down. For some reason I love going back to old favorite places slightly more than discovering new ones. Hopefully they will return. How lovely to be actually able to go out to a restaurant at lunch. The 35 minutes I spend in the teacher's lounge are not that fulfilling! 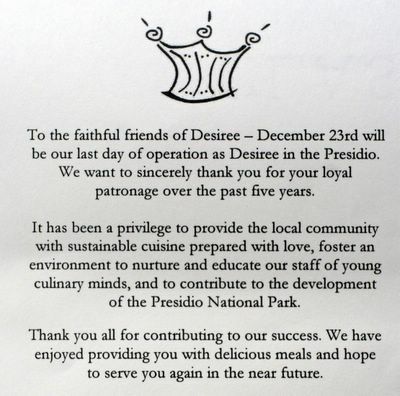 This is such a sad loss to our SF restaurant community -- it will be remembered fondly. I always feel it's somehow my own fault: If I had gone there, would they have had enough business to stay open? All I can say is jwqlwgv! cookie crumb - there is always tomorrow if you care to join me. If that's not possible, make sure you get your arse over to Tabla and give them your support instead. No excuses - they are only just down the road from you. PS - I dont think it was due to lack of business they closed, rather to moving on to other things, so its probably not your fault, but if you enjoy suffering the guilt thingy I will carry on pretending you were entirely to blame. Jen - i am glad we ate there together last week. hi sam, aren't the cote d'or bouchees simply the best? read your poignant last post and really feel for your seasonal sense of displacement - nonetheless, hope you are enjoying yourself. take care! Oh, Sam. How nice of you. I'm booked tomorrow, but knowing you're somewhat (a lot, apparently -- hi, Jen) open to partaking of meals with fellow bloggers, I will propose a date in the future. Tabla is *so* on my list. Ask Cranky.